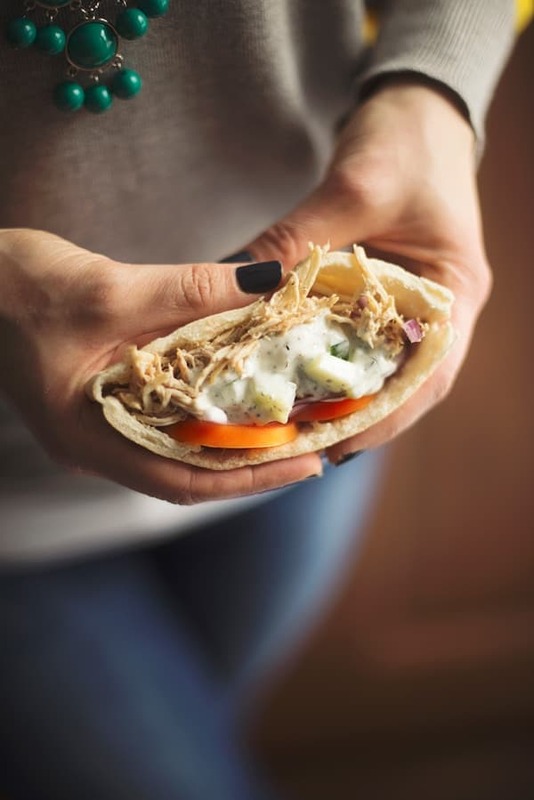 Slow Cooker Chicken Shawarma Pitas with Cucumber Yogurt Sauce are so healthy and easy to make, you will be making this chicken dinner recipe again and again! Although I use my slow cooker all year round, I have been using it almost 3-4 nights a week this winter with our grill completely covered in snow. With the high energy of the #HealthyNewYear challenge in full force, I have been meal planing consistently throughout the month of January which means my slow cooker is getting a lot of extra attention! Of course, just like all of you, I am always looking for more fast and easy slow cooker chicken recipes. 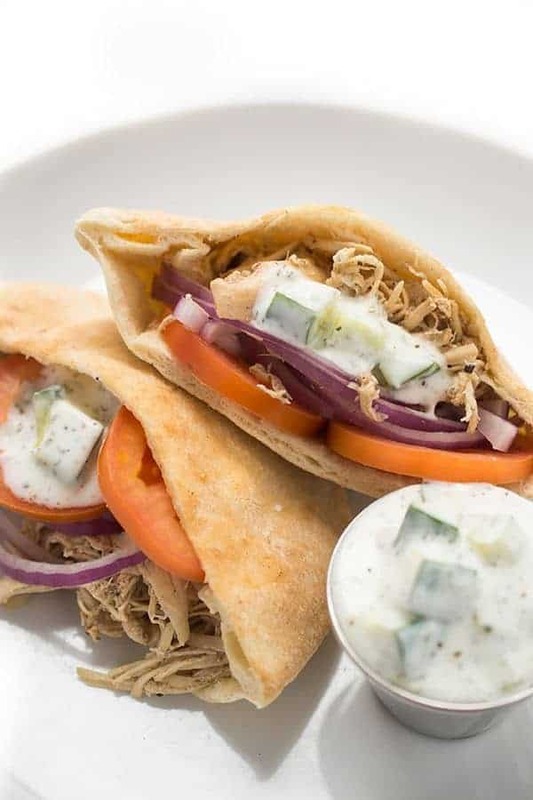 Since my family loves eating Beef Shawarma with Cucumber Yogurt Sauce in the summer months I decided to find a way to enjoy shawarma without the help of my trusty grill. 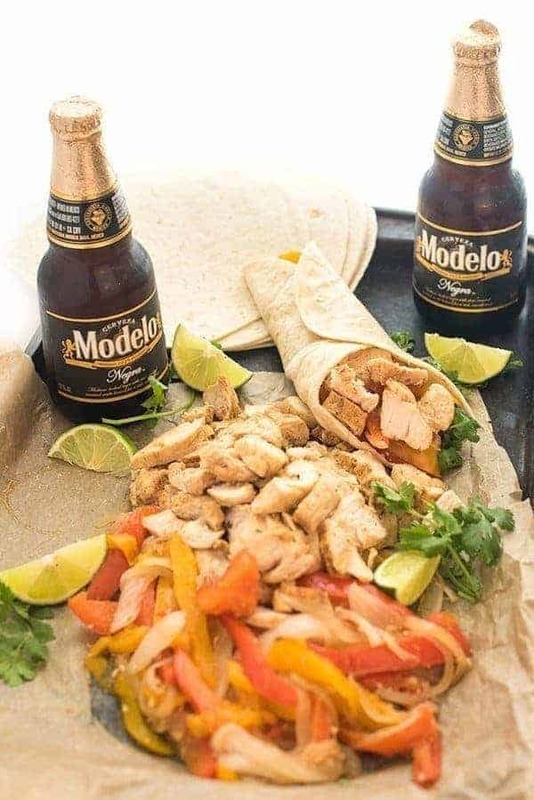 We happened to have a pack of Kroger Simple Truth boneless, skinless chicken breasts on hand but you could certainly swap it out with chicken thighs, pork shoulder or even a beef chuck roast. The real star of the dish is the fragrant yogurt marinade filled with warm spices like cinnamon, nutmeg and all-spice. 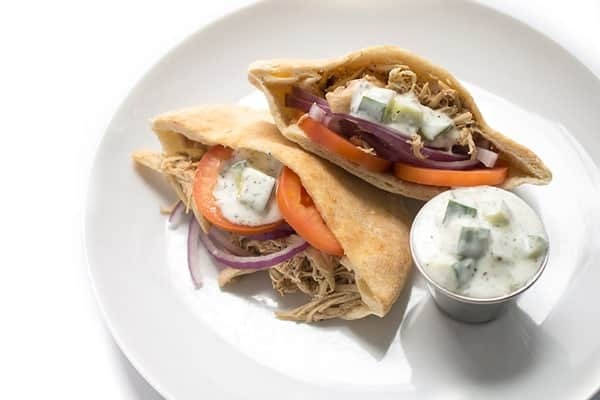 These slow cooker chicken shawarma pitas are topped with a cool and creamy cucumber yogurt sauce, tomato slices and red onions. 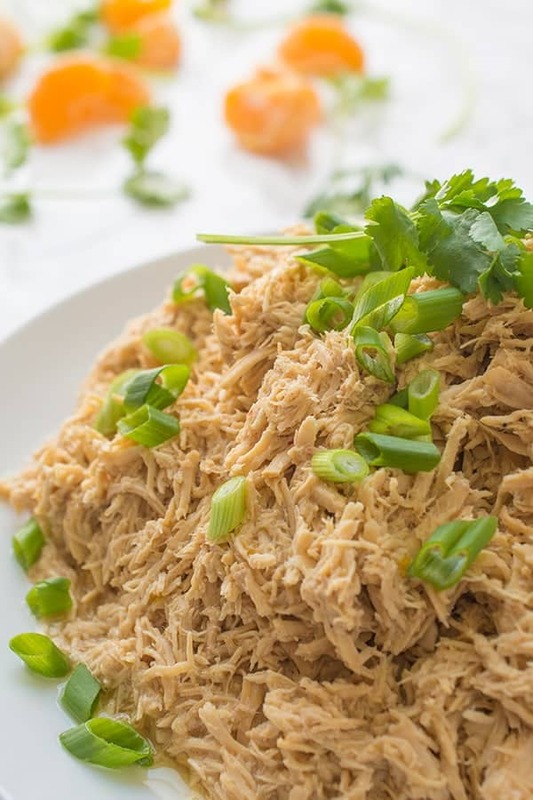 Make an extra batch and use leftover shredded chicken for salads, soups, pastas, tacos and more. The options are truly endless. Place the yogurt, chicken broth, spices and lemon juice in the slow cooker insert and whisk well. Add chicken to the slow cooker and toss to coat with the spiced yogurt mixture. Nutrition Facts do not include toppings or cucumber sauce. You can find nutrition facts for the sauce on the recipe. Simple Truth and Simple Truth Organic products can be found at your local Kroger store. 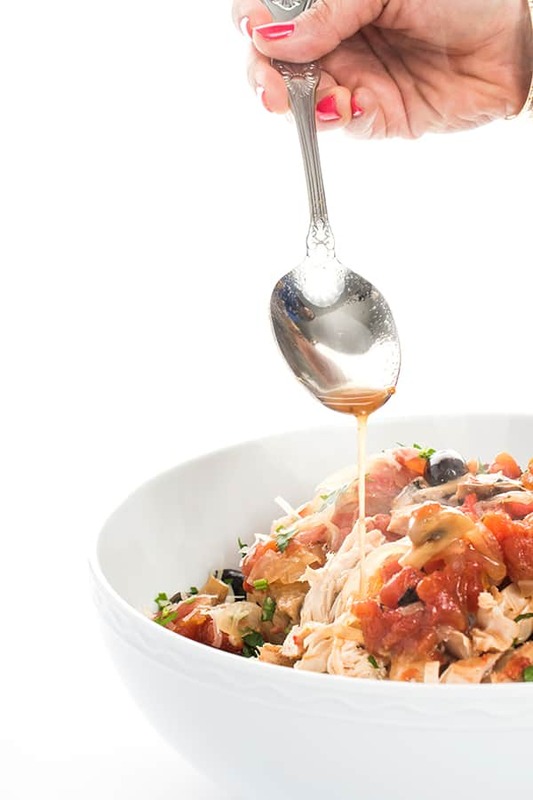 More Healthy Slow Cooker Recipes are waiting for you on Pinterest! So I followed the recipe to the Tee however I tripled it using 5lbs of chicken instead. The first day it came out it tasted amazing all with that tangy taste shawerma has. The next day, I don’t know what happened, but the dish became so spicy it was overbearing and impossible to eat. Maybe my rating is undeserved and I’m sorry. Maybe it’s a dish I have to eat right away. I’m not sure. Hi Nika, I’m a little confused – you said the flavor turned from mild to spicy as it sat in your fridge? I’ve never experienced this. I make it all the time and it’s great as it sits. Did you add anything spicy? Cayenne? This was wonderful! I honestly wasn’t sure I was going to like the spice blend – it smelled to me like pumpkin pie cooking, which is nice, but not what I want when I’m thinking about chicken. But OMG it was so incredibly good with the yogurt sauce, red onion, and fresh tomatoes from the farmers market! I almost never want seconds of anything – but I wanted another helping of this! As an aside, I used unsweetened coconut yogurt in this recipe, and in the yogurt sauce, to make this non-dairy, and it came out great! No weird taste or anything! Definitely recommend if you have any dairy concerns in your household! Yet another awesome recipe from The Lemon Bowl – haven’t had a single one I didn’t like yet! Thank you for the inspiration! Is the chicken already cooked before it goes in the slow cooker? I’ve just volunteered to do this for a school fair! :) And two baked items as well! :O So I am going to need to spread things out over the week. How far in advance can I cook this, and how long will it keep? I’m thinking four days in a fridge won’t dry it out. Oh I’m so glad to hear it!! You can cook it 1 day ahead of time and it will keep up to 3 days! This sounds so good, I’m trying it this weekend! I live alone, can the leftover cooked chicken go in the freezer? You know this type of chicken I don’t typically freeze because I don’t believe it will have enough moisture to protect it. That said, I could be wrong so if you try it and it works please let me know! Otherwise I would use leftovers during the week for lunches or repurposed in tacos, salads, soups, pastas etc. Hi Liz. How do I improvise as I don’t have a slow cooker. Love your recipes and stunning photos. You really are my inspiration as I’m just about to pop with my 2nd baby and can’t wait to get back into shape. Thank you so much for your reply Liz. I certainly will have a look online and in local stores for any deals on them! Love your recipes and your page! Aww thank you so much Natasha!! Appreciate it! Oh, this was SO GOOD and incredibly easy. I can’t wait to make it again — definitely a dish that is even better as leftovers! We had ours over rice and eggplant, and it was such a great, filling meal. Awesome work, Liz! Oh I’m so glad you enjoyed it!!!!!! Aww thank you so much!!! I hope you try it and love it!! Yes!! We can make Knorr minute sides to eat on the side!! PS: Not kidding. I love to use my slow cooker all year too but I use it even more when it’s cold. 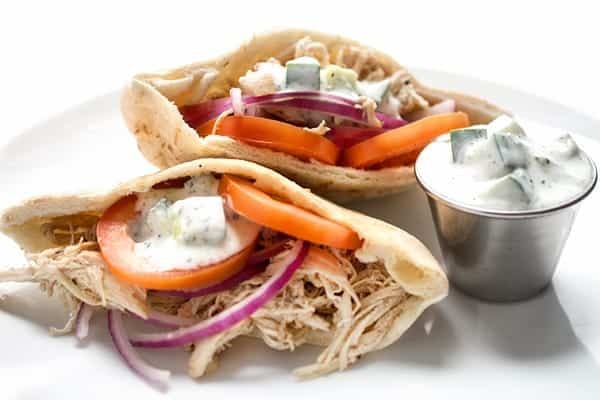 Can’t wait to make that Cucumber Yogurt Sauce to go with these pitas! I do too Angie!! I hope you like this! You are so lucky to have one nearby!! Thank you Liz. Love this recipe. So glad you do Liz!! Enjoy! I ADORE shawarma!! We always have it in pitas with cucumber sauce too. SO crazy good! Sometimes I just come up with recipes that allow me to make cucumber sauce – haha! What would happen if I used nonfat yogurt? Not a thing at all!